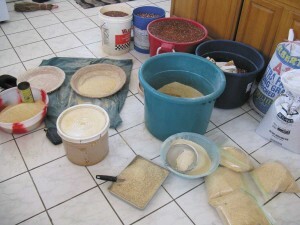 Middle Caicos grits have a long and distinquished ancestry. In Hispaniola both Indians and Spaniards have two kinds of bread. One sort is made of maíz, which is a grain, and the other of cassava. Maize is grain that is borne on an ear about six to eight inches long. This ear or spike is covered with grains almost as large as chickpeas. Simon would never claim to be of Taíno descent. So what could my research possibly have to do with him? What does Simon’s dancing have to do with global climate change? And why eat the grits? Simply stated, what most fascinates me is tracing historical connections; teasing out those aspects of the past that have created the present, and are likely to influence the future. The next time I saw Simon we were excavating a Lucayan Taíno site in a field near “Snapper Grass” next to Farm Creek Pond on the north coast of Middle Caicos (MC-32). It is a kilometer walk from Bambarra Landing to the site, and there were no farm plots (sometimes called “casual cultivation” on the topographic maps) until you reach the archaeological site. Simon was very gracious in allowing us to work in his garden, and he extolled the virtues of the land and the fabulous produce that he was able to grow there. The reason that this particular plot of land was so productive is because the original inhabitants of the island lived there for about 200 years (circa AD 1300–1500) and their refuse (garbage, night soils, etc.) had greatly enriched the fertility of the otherwise sandy soil (called “whitelands” due to its light color and lack of fertility). The site has over a meter of very dark, organically enriched soil (along with artifacts from the original inhabitants) that extends to a depth of over one meter. Although it may be hard to envision, there is a definite connection between the remote past and the present. On other islands, Mayaguana for example, we have found that the “native” vegetation is far more luxuriant on Indian sites. Furthermore, throughout the Turks & Caicos, Shaun Sullivan found that archaeological sites are almost always found in Guinea grass patches (a grass introduced from Africa as cattle fodder) because this grass pioneers disturbed (formerly agricultural) landscapes. In essence, the modern landscape is the product of human activities going back thousands of years. The historical thread is that the land Simon farmed was superior to the surrounding whitelands because the garbage of native peoples had enriched the soil. In addition, it was Amerindians who first cultivated many of his crops. This is a classic example of how much of what we do today is a legacy of the past. About 20 years ago the Florida Museum of Natural History developed a museum exhibit called “Better than Gold.” The point was that Amerindian plants transformed European cultures in more profound ways than did shiny metal. Maize (Zea mays) is perhaps the most important crop in history. The British called it “Indian” or “Guinea” corn because the word corn means “small bit.” The Taínos called it maíz. The ancestors of maize are apparently wild grains related to teosinte and tripsacum, with small ears the size of a person’s thumb. It is possible that modern corn developed when humans carried this grain south from Mexico into Central and Andean South America where those related species crossbred. Cobs found in caves inhabited by people southeast of Mexico City date to 5,000 BC. Recent evidence from the study of pollen, phytoliths and starch grains suggests that humans in Central America began managing maize up to 10,000 years ago, and that it was brought into the Caribbean islands about 4,000 years ago. The early races did not look much like modern varieties, and it may seem odd that people focused their attention on a plant that produced a small number of grains that required special collection methods and processing. Yet we now know that a wide variety of small-seeded grains (including wheat, rice, millet, sorghum, chenopodium, and amaranth) were cultivated at early dates to supplement what were otherwise foraging economies (more popularly known as hunter-gatherers). In the early variety of maize each kernel was covered by a cupule so it was necessary to winnow the collected seed to remove this inedible covering. Through human manipulation the kernels eventually became “naked” with only a surrounding husk. Despite its humble beginnings, maize has transformed our world. When you go to the cinema or watch a movie at home you must eat popcorn. High fructose corn syrup is used to sweeten foods and soft drinks, and along with the corn oil used to fry foods, are major contributors to obesity. When you put gasoline in your car, up to 10% is ethanol distilled from maize. The steaks you just grilled are probably corn-fed beef, and cattle are significant contributors to global warming (methane). Cornstarch and corn meal are used to produce a wide variety of products, and maize agriculture receives billions of tax dollars in subsidies from the U.S. government every year. Maize can produce incredible yields per acre, but also requires enormous inputs of water (irrigation), fertilizer (nitrates) and pesticides, all of which degrade our environment. Moreover, maize yields were increased by creating a sterile hybrid, so farmers must buy their seed every year from the companies that hold the patents. In sum, maize has become the perfect storm. We cannot blame the crop for its unintended consequences. Few plants have been so amenable to human manipulation. Maize now serves a vast number of purposes, is grown in a wide variety of environments, comes in a bewildering number of colors (check out blue corn tortilla chips), and is a component of almost everything we eat, drink or drive. Moreover, it has even been converted to entertainment. 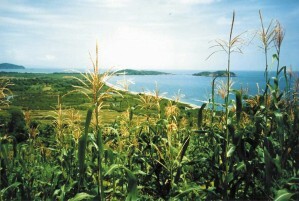 Because it can be grown at such a high density, corn mazes, more properly maize mazes, have become hugely popular during the Halloween season. There are more than 300 races of maize. The plants range in size from two to twenty feet tall, with eight to 48 leaves, one to fifteen stalks from a single seed, and ears that range from thumb-sized to two feet in length. The basic classification recognizes “dents” with a softer kernel (95% of all maize), “flints” with a hard starch, “sweet” with a higher sugar content, “floury” with soft and mealy starch, “waxy” composed entirely of amelopectin, and “pop” which is a very hard flint — the water in the starch steam-pressures the endosperm to explode when heated. Maize is a highly nutritious food, and contains more protein than any other cultigen. It has essentially the same nutritional content as breast milk, and has long served as a weaning food. It contributed to the rapid growth of human populations throughout much of the Americas, and was the staple crop for the Maya and Aztec. The one missing amino acid is lysine, which is found in beans. In Mexico, at the time of the European invasion, most gardens contained the perfect food combination; the “three Mary’s”: corn (maíz), beans and squash. In the past, maize was people food. Today, nearly 80% of the harvest goes to feed cattle and fuel automobiles. Both of these uses have contributed substantially to global warming. Boy and girl cows have stomachs that evolved to digest grasses. You can feed them corn, and they will mature faster and she produces more milk, but they cannot completely digest the proteins in maize. The resulting “cow patties” are loaded with methane gas. Methane is the most egregious of greenhouse gasses, and cattle, not cars, are the main contributor to global warming. Maybe we should follow the advice of Chick-Fil-A and “eat mor chiken” (but this raises a whole number of other issues). In addition, the U.S. government has promoted the use of ethanol as an alternative fuel for cars, and corn growers now benefit from a number of subsidies. Yet, ethanol is a far less efficient fuel than gasoline, and the quantities of water, fertilizer, fuel for farm vehicles and the processing required to produce this fuel have never been fully disclosed. The use of ethanol may actually contribute to global warming. And recent commentaries have asked whether we should grow corn to feed cars or to feed people? Enough gloom and doom; there is nothing quite like the original product. While conducting a survey of North Caicos years ago, our local guide stopped in his family farm and roasted several ears of corn on an open fire. When I peeled back the husk I found that several rows had popped. This was the only time I was ever treated to popcorn on the cob! Had this corn been allowed to fully ripen it would have been ground into the porridge that we call grits. There are only a few places in the world where you can still get “legacy” corn. Middle and North Caicos are two of those places (we have colleagues doing DNA studies to trace the heritage). There is a world of difference in taste and nutritional value between legacy and modern varieties. We suggest you be a “locavore” (eat locally grown foods). Visit Daniel’s Café in Conch Bar, Middle Caicos, for a traditional grits breakfast on Saturdays, or buy these locally grown and hand-ground grits at the Middle Caicos Co-op on the second Saturday of each month at the Graceway Supermarket in Provo. You will experience a unique connection to the past, not to mention that there is nothing quite as tasty as Middle Caicos grits. Dr. William Keegan is Curator of Caribbean Archaeology at the Florida Museum of Natural History, University of Florida, Gainesville, FL. Landscaping is an almost unknown term in Middle Caicos, but small “farms” are found throughout the island where crops of cassava, okra, sweet potato, pigeon peas and corn still flourish. Home is where the heart is when it comes to Caicos corn . . . it is a beloved treat at all stages with new corn roasted on open fires and the favourful local grits sparking up all kinds of home cooking. The pearly kernels dry hard on the stalk in the field; then the ears are carried home to be stored in the roof until time to grind. The kernels are stripped from the cob, ground with hand grinders (once for coarse, twice for a fine grind) and then the laborious process of “fanning” the grits to release the chaff begins. Fanning involves the use of a specially made shallow rim basket, locally known as a fanner basket, and made with fanner grass! In this basket, the grits are tossed and turned, with the lighter chaff blowing away in the breeze. Amazingly, the process ends with corn flour on one side of the basket, and bright coloured yellow grits on the other. Once cleaned and fanned, the grits are kept cool and fresh, ready to purchase at the Conch Bar Artisan Studio & Outlet. Local chefs use these grits to the delight of patrons. Daniel Forbes’ special, at Daniel’s Café in Middle Caicos is Conch and Grits, a treat that brings the flavor of the ocean to this simple dish. In a world of fast food, these wonderful grits, a labour of love and time, offer a taste sensation that is long remembered. Use 3 cups water, salt to taste, 2 teaspoons butter, and 1 cup grits. Put water, salt and butter in medium pot and bring to a full boil. Add grits and stir thoroughly. Cover and cook over medium heat for 15 – 20 minutes. Check grits after 10 minutes – if too stiff, add more water (¼ cup – ½ cup). When cooked grits will be smooth and even. Serve as a side dish with more butter, salt and pepper. Popular local options: Cook local beans, fry with butter and onion, and add to grits while cooking or chop and wash salt beef and add to pot with water, then boil with grits.